Xenocs is very proud to announce the sale of a Xeuss 2.0 HR SAXS/WAXS equipment to the University of Strathclyde in Glasgow. It will be the first SAXS/WAXS laboratory system in the world equipped with a Triple Source Module, which is an innovation 2016 from Xenocs. Up to now, with its fully motorized Dual Source Module Option Xenocs was offering the users the capability to switch from one energy to a different energy in a automatic, quick & smooth way, with automatic realignment of the beamline. With the Triple Source Module option, Xenocs extends this capability to three sources with three different energies, offering maximum versatility and optimized performances depending on the measurements and samples to be carried out. The system at the University of Strathclyde will combine the Copper, Molybdenum and Chromium energies. The instrument will be installed next November at the CMAC Centre to support various research projects. It will be used for investigating and studying various types of samples such as nanostructure and self-association in small molecule solutions, nanoparticles in suspension, internal structure of particles in mesoporous systems, structure & interactions within biopharmaceutical systems, or liquid crystalline systems. With 80 researchers and students directly involved, CMAC activity is world scale. 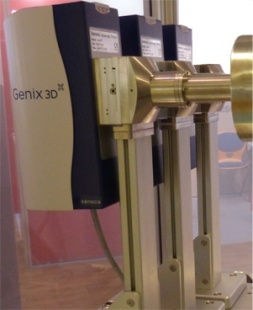 The Xeuss 2.0 HR SAXS/WAXS instrument aims to be a platform for multiple users, benefiting the wide academic community at Strathclyde and beyond. About EPSRC National Centre for Innovative Manufacturing in Continuous Manufacturing and Crystallisation (CMAC). CMAC is one of the 16 EPSRC -Engineering and Physical Sciences Research Council - UK Centres for Innovative Manufacturing. As part of the Technology and Innovation Centre at the University of Strathclyde, CMAC aims to accelerate the adoption of continuous manufacturing and crystallisation processes, systems and plants for the production of high-value chemical products, improving their quality at lower costs, more quickly and sustainably. The objective is to create an effective partnership with industry, academia and public bodies.